Alan Wightman is a screenwriter, playwright, author and comedy writer who began his career writing material for television entertainment programmes, working with British and International stars such as Jimmy Tarbuck, Cilla Black, Dionne Warwick, George Benson, The Muppets, Des O’ Connor, Bob Monkhouse, Lionel Richie, Joe Pasquale, Brian Conley, Sir Roger Moore, Shane Richie, Mel Gibson and others. 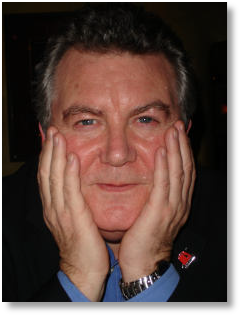 He is the author of several books, including “Freddie Starr – Unwrapped! “, “The Big Thick Joe Pasquale Book”, and “Money Talks!”. Alan has written over twenty pantomimes for leading theatre producers, wrote the book(script) for the Kings Head Theatre Islington’s musical “The Famous Five“ which also toured the U.K., and the musical “Don’t You Rock Me Daddio!” with music & lyrics by Joe Brown and Roger Cook. Alan’s film “ Bloodline “, won the Best Short Film Award at the 2008 Marbella International Film Festival and was subsequently shown at the Gotham Screen Festival in New York and the Festival Of British Cinema in Hay On Wye. He has two screenplays in development - “ The Astrologer “, a comedy-thriller set in London and Mumbai and a supernatural western entitled “ Blood Moon”. During 2012, Alan wrote a new stage musical “Jump, Jive and Wail! “for Ghost Light Productions and additional material for “The Hurly Burly Show“ at London’s Duchess Theatre. Alan is currently working on a science-fiction TV mini-series for a production company in Finland, updates a comedian’s blog every month and continues to supply entertainers & journalists with up-to-the-minute comedy material. Pantomime for the 2008/9 season. Produced by The Owen Money Theatre Company.